At first glance I thought those two were riding those bugs and jousting. Now THAT would be a stupid cover. It’s like a dog seeing its own reflection. Was this sorcerer called Exotropia Stabismus? Astoundingly we have yet another example of the Misplaced Scabbard Syndrome, where an apparently right-handed swordsman has his scabbard on his right hip. What is wrong with these cover artists? Have they never engaged in swordplay? I do think that over the past years I have made a case for a “Misplaced Scabbard” tag, no? So he’s definitely fighting his evil twin or duplicate on an icy lake while not-Skeletor watches from on high, yes? You can pick your skulls, and you can pick your nose, but you shouldn’t pick your skull’s nose. When I saw this cover, I immediately thought of Wagner’s “Ride of the Valkyries”. I think they’re both good guys – neither has a tell-tale goatee. @B’mancer (1): At first glance, I thought they were both bug-centaurs, which I think is even worse! @Tor: GSS! You’ve summed it up perfectly. No comment on the new tag Tag Wizard created for this cover? Skeletor did a lot of celebrity guest appearances just to coast on his “He-Man” fame. 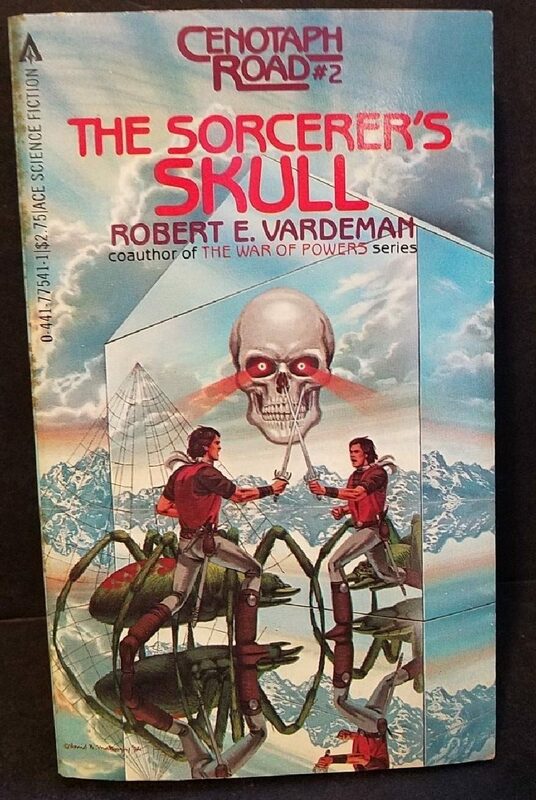 You have to admire the artist’s dedication to mirror image action, given that he or she has included both a vertical AND and horizontal mirror image, for a total of four views of a single character and his arachnoid companion.